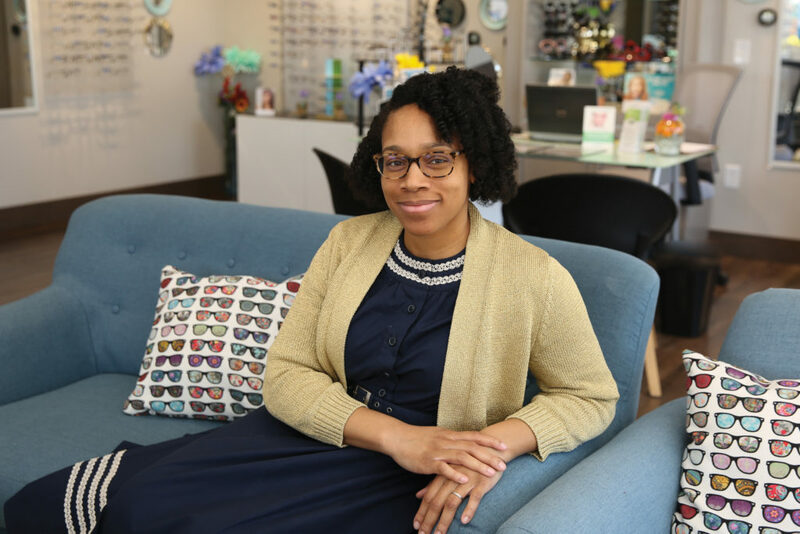 Olayemi Swindell of New Vision Family Eye Care places the emphasis on the individual. How’d you get into the field? I’ve always wanted to be a doctor. I just didn’t know what kind. My junior year of high school, we were asked to interview someone for a class assignment. I had just received contact lenses and had been seeing an optometrist often. The doctor always seemed like she was on cloud nine; I was curious to know why. One thing she said was that becoming an eye doctor was the best decision she’d ever made. I decided right then that this was what I wanted to do. Did you know you wanted to run your own business? After college I worked at a few places in Chester County, but nothing ever felt like “it.” My husband and I discussed the idea of opening the business and decided to go for it. What’s most improved now that you own the business? I have control of the quality of service that we give to our patients. A lot of places I worked before, the focus on patient experience wasn’t there. The fact that I can control the patient’s experience and make changes to keep improving is a major benefit. Has that caused you to notice customer service elsewhere? Absolutely. I remember going to a local restaurant that’s been one of my favorites, and I saw how poorly managed it was. I saw, from the customer’s side, how it looks when you’re not put together. Conversely, I really appreciate when places care about every aspect of the customer experience. I feel like there’s a whole philosophy behind it. It’s up to you whether you want to buy into that philosophy or not. It’s not easy, especially if you are bent on creating the best customer experience. You almost have to individualize it for everyone, but at the same time give fair and equal treatment to everybody. we came up with a mission statement: to change the view of the world around us, one pair of eyes at a time. We want people to understand how important it is to take their eyes more seriously, to look towards the future. By looking at life in a different way, you can control your own destiny, instead of letting life happen.That’s why we’re called New Vision. Do you offer any unique services? We offer eye exams, and sell eyewear, but we also offer dry eyes specialty services. understanding why they couldn’t read like before, or use a computer for long periods of time, or even just wear their contacts comfortably. Since having the dry eye procedures done, they are now able to enjoy these activities again. Doctors had told them there wasn’t much they could do, or that eye drops should solve the problem. But we can do so much more. People don’t realize that eye care is more than just a pair of glasses. It’s deeper than just the surface.